Uni-Jet offers high pressure water blasting for sewer and industrial cleaning applications. With pressure ranges from 2000psi to 20,000psi, our 3 custom built high pressure cleaning trucks and associated equipment have the right combination of pressure and flow to suit many difficult cleaning tasks. These high pressure units are ideally suited for industrial cleaning, mine cleaning, tank cleaning, descaling process pipelines, and breaking up and removing extremely hard debris from sewers. 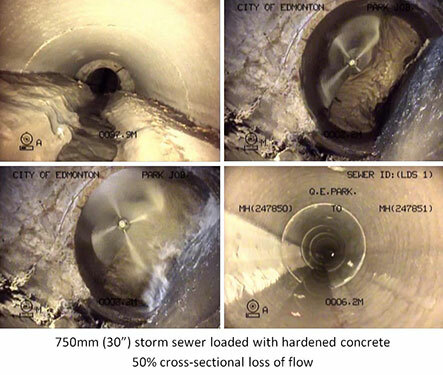 Used in conjunction with sewer cleaning and inspection, high pressure cleaning can assist in dewatering large siphons and cleaning debris loaded large diameter sewers. In addition to cleaning, our high pressure units can thaw pipe and duct lines up to 300m (1000') in length.